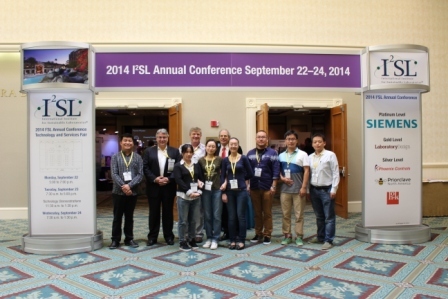 Attendees traveled from around the world for the 2014 I2SL Annual Conference. In this photo, attendees from China pose with I2SL Board of Directors members Phil Wirdzek, Franco Atassi, and Gordon Sharp. 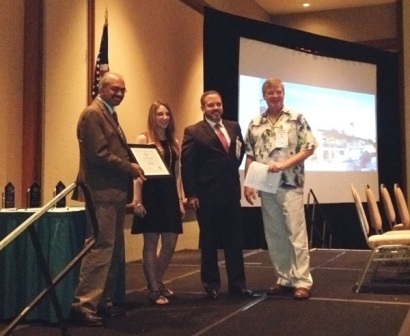 This September, the 2014 I2SL Annual Conference brought speakers, attendees, and exhibitors from various corners of the sustainable laboratory and high-technology facility industry to Orlando, Florida, for an informative and energetic event. A high level of enthusiasm elevated discussions throughout the conference, whether they took place inside technical sessions or in the hallway during coffee breaks. I believe that this renewed energy stems in part from two new developments within I2SL: the establishment of regional I2SL Chapters and the surge of interest in I2SL from professionals in academia. I2SL Chapters have provided a forum for community members to continue to network and collaborate between the annual conferences. Chapters have enthusiastically embraced I2SL's mission as they pursue activities and programs specific to their regions' interests. In addition, a wide range of professionals in academia have turned to I2SL seeking the latest advancements in research equipment, strategies to engage researchers in sustainability initiatives, and solutions in lab engineering and design. Sustainability coordinators, academic planners, and facility engineers have found significant opportunities to share and learn from one another at both the annual conference and through local I2SL Chapters. I2SL's Go Beyond Award winners are also leaders in our community, proving that achieving sustainable, high-tech facilities is possible with the right mix of leadership and initiative. Learn more about this year's winners below and visit our website to see our past winners and this year's winners and nominees. I am encouraged by this growing level of excitement and look forward to seeing how I2SL's community grows in 2015 and beyond. Along with the I2SL Board of Directors, I welcome any and all involvement that can strengthen I2SL's capacity to serve the sustainable laboratory and high-tech facility community. Finally, I wish to recognize the Eastern Research Group, Inc. (ERG) staff who continue to provide I2SL with the highest level of professional support. Along with I2SL's Board of Directors, I am grateful to our ERG staff for their planning and professionalism in supporting I2SL's mission, members, and the conference. Thank you all! As we move into 2015, I wish all in the I2SL community happy holidays and look forward to collaborating in the new year. Thank you to everyone who attended the 2014 I2SL Annual Conference! Attendees from 14 countries gathered in Orlando, Florida, to learn about the latest developments in sustainability at laboratories and other high-tech facilities. By attending presentations on a variety of topics, including third-party financing, labs users and behaviors, and climate neutral campuses, attendees earned more than 1,300 continuing education credits in total. I2SL's onsite mobile application saved more than 12,000 sheets of paper. From the screening of the documentary Chasing Ice to the Tech Fair Reception to the closing reception, attendees took advantage of the time together to network and discuss current issues facing labs and other high-tech facilities. The Technology and Services Fair also allowed attendees to interact with companies that are leaders in the industry. This year, I2SL embraced technology and offered a mobile conference app that included all the conference offerings and details on attendees' smartphones. This high-tech feature also allowed I2SL to save more than 12,000 sheets of paper by not printing conference programs. Conference attendees can still access the app and use it to recall specific presentations, speakers, and contacts. If you attended the conference and need assistance accessing the app, please contact I2SL. Building Information Modeling (BIM) for Laboratory Operations and Maintenance: EcoDomus, Inc.
Read more about the efforts and achievements of this year's winners on I2SL's website. Dr. Sudhakar Reddy (left) accepts the Individual Award for his work with the University of Michigan Sustainable Laboratory Certification Program. Neill Lane (center right) accepts the User Product Award on behalf of Stirling Ultracold. 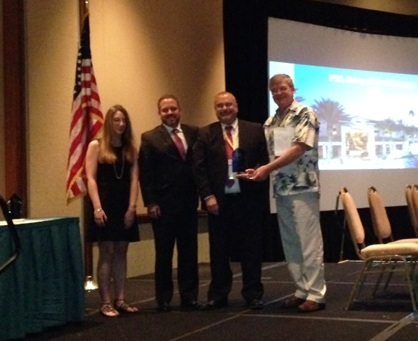 Ernest Fossum (center right) receives the Project Award for the Energy Innovation Laboratory. Not pictured here: Igor Starkov accepted the BIM Award for EcoDomus, Inc. Following the 2014 I2SL Annual Conference, attendee Larry Clark summarized event highlights in a blog post on HPAC Engineering's website. From green laboratories at universities to manufacturers innovating with energy-efficient equipment, read Sustainable Laboratories for Clark's remarks about this year's event. Mark your calendars! 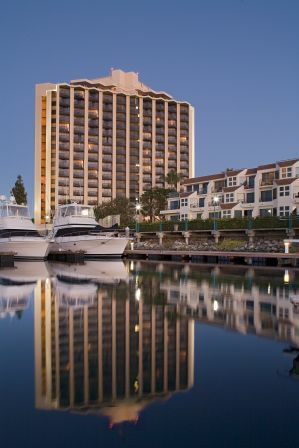 The 2015 I2SL Annual Conference will take place Monday, September 21, through Wednesday, September 23, 2015, in beautiful San Diego, California, with pre-conference activities taking place on Sunday, September 20. The Call for Presenters will open in early 2015. In the meantime, you can make your hotel reservations online or by phone. 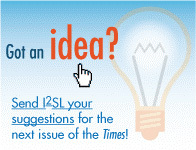 Do you have ideas for the 2015 I2SL Annual Conference? Let us know! Contact I2SL to share your thoughts and help shape the event. A block of rooms is reserved at the Hyatt Regency Mission Bay for conference attendees from Saturday, September 19, 2015, through Wednesday, September 23, 2015. Book your room within I2SL's block to receive a discounted rate! Per diem rooms are also available. Exhibitor registration for the Technology and Services Fair is now open. As of November 10, 2014, the following organizations had already signed up. To join them, register today. Support I2SL through sponsorship today! I2SL will use the onsite mobile application again in 2015, and there are several sponsorship opportunities you can select, including the splash screen or main banner. In September, the U.S. Department of Energy (DOE) proposed new efficiency standards for commercial rooftop air conditioners that would decrease energy use by about 30 percent. Because air conditioners represent approximately 10 percent of a typical commercial building's electricity bill, the proposed standards could yield the greatest energy savings of any DOE standard. In fact, DOE projects that the standards could save businesses up to $50 billion over the lifetime of air conditioning units sold over 30 years. The proposed standards would not only lead to the development of high-efficiency rooftop air conditioners, but also to a decrease in electricity demand and carbon dioxide emissions. The final standards are set to be released by the end of 2015. Read the proposed standards for details. Posters from the University of Colorado (CU) Boulder’s Green Labs Program are now available on I2SL’s website! The Green Labs Program works to minimize water and energy use in the university’s laboratories, without compromising safety or research integrity. The initiative is promoted on posters that can be printed and posted in lab buildings. 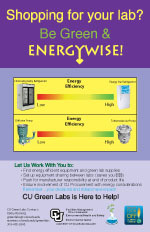 Visit I2SL’s website to download and customize CU Green Labs posters, which feature tips on making labs more sustainable. Additional chapters are being organized in China, Philadelphia, Pennsylvania; New York, New York; the San Francisco Bay Area; and Arizona. 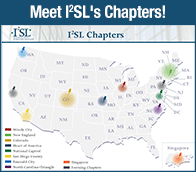 If you are interested in joining one of these chapter-planning groups, or if an I2SL Chapter does not exist in your region and you are interested in starting one, please contact I2SL. Sustainability is a core value in the Pacific Northwest, and with a robust high-tech sector continuing to grow in the region, local industry leaders have recognized the value in establishing an I2SL presence. Formed in September 2014, the new I2SL Emerald City Chapter represents Seattle, Washington, and its surrounding areas. The chapter serves as a local forum for collaborative creation of technologically advanced, energy-efficient, and environmentally responsible laboratories. In addition, the chapter promotes the application of a sustainable, “whole-building” approach in designing, engineering, constructing, and operating laboratories and other high-tech facilities. Officers and members advocate sharing real-world experiences and best practices to reduce waste and minimize water and energy use, while still improving daily facility operations in all types of laboratories. To learn more about joining or sponsoring the chapter, or to participate in the November 18 First Meeting and Membership Drive, please contact the Emerald City Chapter. The I2SL New England Chapter featured poster presentations from 2014 I2SL Annual Conference speakers at its October 14 event. Now almost a year old, I2SL's New England Chapter has been busy keeping its members fully immersed in sustainable lab happenings. 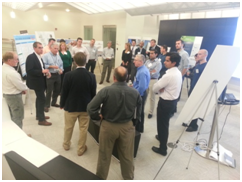 After hosting a networking reception at the 2014 I2SL Annual Conference in Orlando, Florida, the chapter held a conference recap event on October 14, 2014, in Cambridge, Massachusetts. The event featured poster presentations from conference speakers and offered chapter members the opportunity to network with fellow experts in lab sustainability. Visit the chapter's Web page to read a full summary and download posters from the event. With a threefold increase in local I2SL membership over the past year, the New England Chapter has many activities in the pipeline and is looking forward to year two. The chapter is seeking additional volunteers to help shape and organize events in 2015 and encourages interested individuals to email chapter leadership to learn more about getting involved. On October 20, 2014, the I2SL Windy City Chapter gathered for a training session hosted by Hill Mechanical, where I2SL Board of Directors Vice President Gordon Sharp offered the I2SL Workshop: Evaluate the Savings and Return on Investment (ROI) of Laboratory Energy Savings Strategies. The workshop’s 32 attendees learned how to utilize Sharp's holistic energy analysis tool for evaluating laboratory energy savings strategies. I2SL's Singapore Chapter, also known as the Singapore Sustainable Laboratories Group (S2Lab), formed to promote and push the boundaries of laboratory sustainability in tropical Singapore. The chapter was formed with support from the research team at the Energy Research Institute at Nanyang Technological University, Sustainable Energy Association of Singapore, and Singapore's National Environment Agency. The chapter's vision is to be a platform for experts and key players in the laboratory industry to discuss topics on energy efficiency, health and safety, and best practices for operation and maintenance. The chapter will also serve as the platform where best practice guides and guidelines for laboratory buildings, cleanrooms, and research facilities are developed. The chapter recently hosted the first Singapore Sustainable Laboratories Conference in October, which drew close to 100 participants from Singapore and overseas. The chapter is excited about the momentum created by the conference and looks to keep that momentum going as it moves into 2015. This Thursday, November 13, from 11 a.m. to 2 p.m., I2SL's Heart of America Chapter is offering an exclusive tour and networking luncheon at Labconco's corporate headquarters and Kansas City Plant. In addition to tours of the demonstration and testing labs and manufacturing facilities, attendees will also be treated to a presentation, demonstration, and discussion in the Labconco auditorium about fume hoods. Attendees will be eligible for up to three continuing education credits for participating. If you're in the Kansas City region, mark your calendars for January 8, 2015, when the Heart of America Chapter will host a networking happy hour. More information on this event will be available soon. Learn more about the Heart of America Chapter and its activities. As competition for grants in university science becomes increasingly fierce, the need for laboratory efficiency and sustainability will continue to grow. Read about the “new normal” in university science funding, and post your thoughts to I2SL's LinkedIn group. With a growing number of academic professionals expressing interest in I2SL, the I2SL University Alliance Group (UAG) has been created to explore issues related to sustainability at academic research institutions. The UAG presently focuses on connecting sustainability to federally supported research at universities and working cooperatively to influence change. UAG meets both by webinar and face to face at the I2SL Annual Conference. Contact I2SL to join the UAG. I2SL's Laboratory Continuous Performance Improvement Program Working Group continues to develop a rating system to evaluate and encourage ongoing sustainability performance in new and existing laboratories and high-tech buildings. View the draft Laboratory Continuous Performance Improvement Program Tool to see what the group has created so far. The group is always looking for participation from new members in the sustainable facility community. If you are interested in joining, contact I2SL. The John Edward Porter Neuroscience Research Center was designed to encourage collaboration. Photo by Alain Jaramillo. A recent article in Laboratory Design Newsletter points out that with an evolution in team-based and interdisciplinary research, it is important for laboratory planning and design to adapt to better support scientific progress. New biomedical research facility designs have focused on encouraging collaboration and innovation, with a number of key facility planning issues emerging for consideration. These include developing flexible laboratory spaces, optimizing spaces for team research, incorporating interactive technology, and providing virtual meeting spaces for researchers to communicate with colleagues around the world. In addition, these facility advances have illuminated the need for greater energy efficiency, as well as finding new sources of funding. Read the full article in Laboratory Design Newsletter to learn more about these and other issues brought up by recent developments in biomedical research facility design. The following are just some of the industry events taking place over the next few months. Visit I2SL’s online calendar to learn more about these and other upcoming events, and contact I2SL if you have an industry event that you would like us to share. 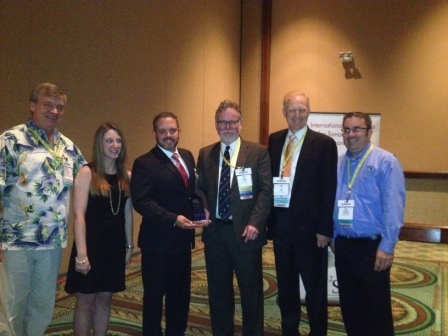 Keep an eye out for the December 2014 issue of Laboratory Design Newsletter, which will feature select extended abstracts from this year's conference and a write-up on I2SL's 2014 Go Beyond Award winners. 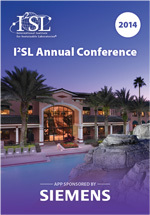 The Call for Presenters for the 2015 I2SL Annual Conference will open in January. Stay tuned for details in the new year! In 2015, I2SL will present new High-Tech Talks. Check I2SL's website to view the webinar schedule. In the meantime, I2SL Members can access past webinars in the webinar archive by logging into the Member Portal. I2SL Chapters show no signs of slowing down, with chapters in the works from New York City to the San Francisco Bay area. 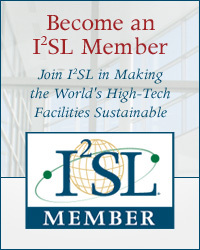 If there is not already an I2SL Chapter in your region, contact I2SL to learn more about starting one. The I2SL High-Tech Talks Webinar Series seeks speakers who would like to present an hour-long webinar session in 2015. Please contact I2SL if you are interested in this opportunity. Tim Kehrli, Stirling Ultracold• Jim Plourde, Schneider Electric • Tom Smith, Exposure Control Technologies, Inc.
To unsubscribe from I2SL’s Sustainable Laboratory Times, please email I2SL.